One hallmark of most Apple products is the tight integration between hardware and software. By controlling everything from the device to the apps running on it, Apple can design unique experiences that competitors have a hard time matching. Nothing highlights the advantage of that hardware/software interplay better than one of the few products where it's missing – CarPlay. It’s the exception that proves the rule. Don’t get me wrong – I prefer CarPlay to any auto manufacturer’s entertainment system that I’ve used, but the projection of a custom iOS interface onto my Honda’s laggy touchscreen reminds me every time I poke at it that I’m seeing a mirage. It looks like an Apple product on the surface, but the resemblance is only skin deep. 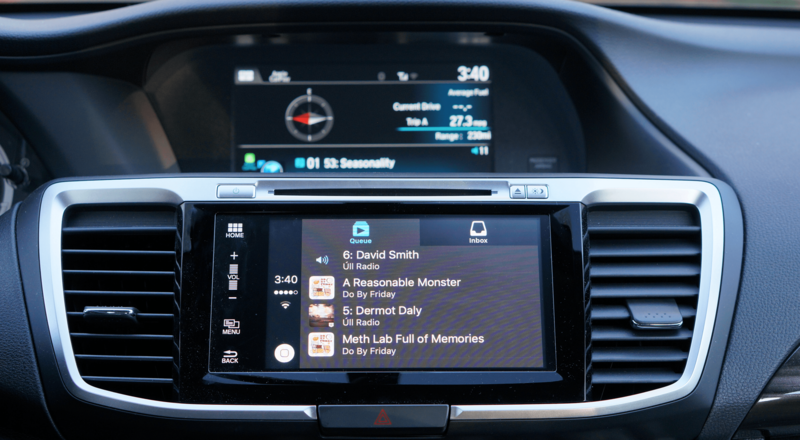 As soon as you interact with CarPlay on Honda’s hardware, the spell is broken. Siri goes a long way to help maintain the illusion, but it's a bridge too far that makes me long for an integrated solution that isn’t hamstrung by the Honda's hardware. This past June, I was suddenly thrown into the car market when the 2001 car I was trying to squeeze one last year of use from gave up the fight. The wheels literally fell off. The demise of my old car felt like bad luck at the time, but the timing was good in one sense. CarPlay was introduced at WWDC in 2013, but it took a couple years before it became widely available. Car manufacturers move at a glacially slow pace compared to tech companies. Aside from a few high-end models and after-market options,1 the choices in those early years were so limited, CarPlay wasn't a realistic option for most people. The options are much better today. In contrast to WWDC 2014 where Apple demoed CarPlay in a $300,000+ Ferrari FF, Apple now lists forty-four manufacturers of over 100 models of cars that support CarPlay in 36 countries. Now the chances are better than not that you can find a car with CarPlay that meets your needs and budget. Consequently, it wasn't too hard for my wife and I to settle on a 2016 Honda Accord with CarPlay that worked for our family. CarPlay runs on a touchscreen in the center of my dashboard. A second display above it shows album art and other information. At first glance, CarPlay looks and feels like its own operating system. It's not, which is important to keep in mind when using and evaluating it. 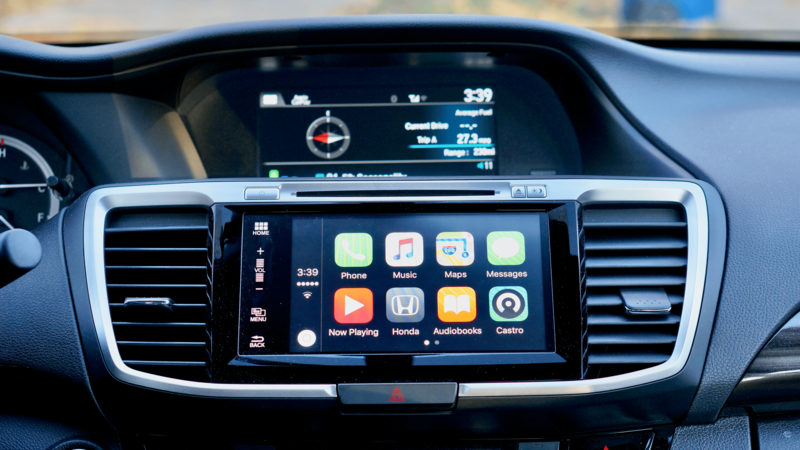 CarPlay is a projection of iOS' UI onto car manufacturers' hardware optimized for in-car use.2 All computing and communication with your car's head unit occurs on, and is controlled by, your iPhone. Your in-car display is merely an accessory. One of the chief benefits of this model is that it allows Apple to update CarPlay with iOS so users get upgrades to CarPlay without purchasing a new car or entertainment system. The downside is that any hardware limitations of your car are constraints that you'll have to live with far longer than you're likely to own your iPhone, unless you get a new car as often as you do a phone. Car models currently for sale support CarPlay connections via USB only. My Honda has a USB outlet below the touchscreen at the level of the automatic transmission shifter. I plugged a Lightning cable into the outlet, connected my iPhone, and after I started the car, a CarPlay button appeared on the screen of my car's entertainment system. I tapped the button and CarPlay took over the screen, which displayed Apple's built-in apps and third-party apps on my iPhone that support CarPlay. That's all there is to it. 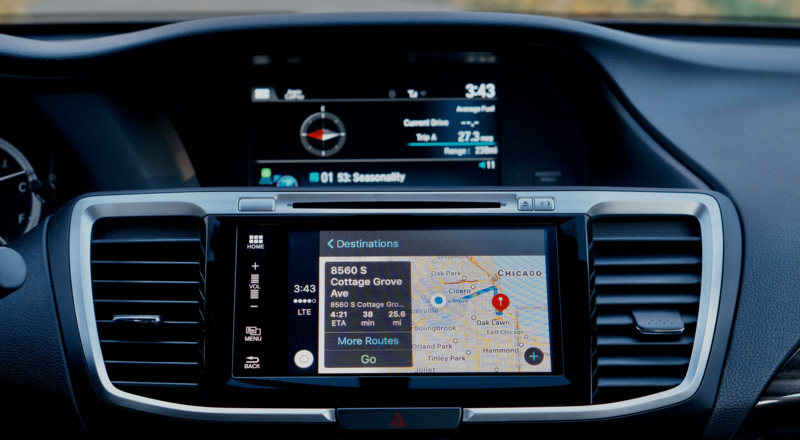 Wireless CarPlay connections were announced with iOS 9 in 2015, but are not available in any car models other than the BMWs yet. 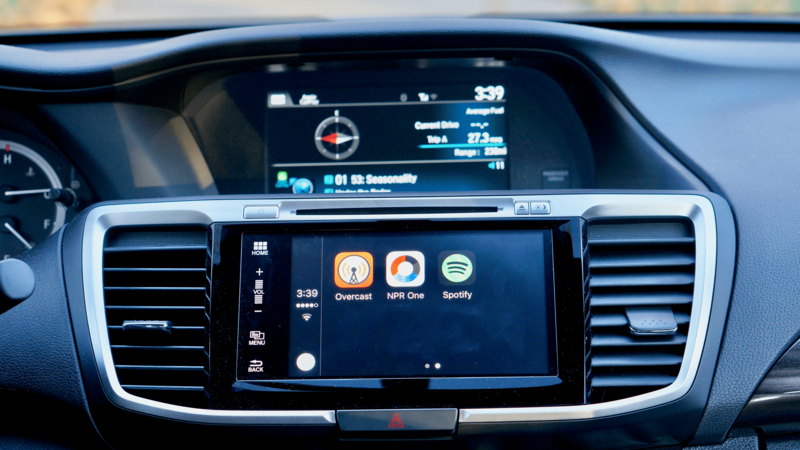 With wireless CarPlay, the initial CarPlay connection will be initiated by Bluetooth, but once connected, WiFi will take over passing audio and video between your car and iPhone, freeing you from tethering your phone with a Lightning cable. Maps' CarPlay interface received a major redesign with iOS 10. The CarPlay startup process is dead simple and painless, but at least in my car, it isn't fast. I can plug in my iPhone, pull out of the driveway, and get part way down the block before CarPlay shows up on my Honda's touchscreen. From the moment I start my car to CarPlay showing up on my car's touchscreen, it takes about thirty seconds. Much of that time is clearly Honda's entertainment system booting up. It's not a long time, but it's long enough to be annoying. I would much rather find what I want to listen to before I pull out of my driveway, but doing so feels like an eternity if you're used to starting your car and taking off. The other pain point for me with CarPlay is my Honda's touchscreen. Honda says it’s capacitive, but it has that laggy, unresponsive feel of a resistive touchscreen, which is terrible for doing things like scrolling lists. Both this and the slow CarPlay startup process have more to do with Honda’s use of underpowered, inferior technology than any limitation of CarPlay, but it nonetheless makes for a subpar experience compared to using an iPhone. Fortunately, there are other ways to control CarPlay, which supports physical buttons and knobs as well as Siri. My Honda has buttons to change the volume and skip forward and back among audio tracks. However, CarPlay also supports more complex knobs used for scrolling lists and selecting items. Siri is invoked by pressing and holding the hands-free button on the steering wheel. All CarPlay implementations must also support Siri. Triggering Siri will be familiar to anyone who has used it on an iPhone. It works the same way, except that the button you hold down is on your steering wheel and you speak into your car's microphone. Honda's system seems to lag a little compared to the iPhone, which took some getting used to, but once I did, using Siri in my car became my favorite way to control CarPlay. Siri is much easier to use than the touchscreen. In fact, the convenience of using Siri with CarPlay is so much greater than when I use it on my iPhone that it feels like Siri works better in the car. I know that's not the case, but such is the power of context. When you disconnect your Phone from your car, CarPlay remembers where you left off and picks back up when you reconnect your iPhone later. I appreciate this feature the most on weekends when I'm out running errands that require me to make multiple stops. A Castro update coming next week uses a tabbed interface that was introduced with iOS 10. CarPlay supports three types of apps: audio, messaging, and car manufacturers' own apps. The core built-in Apple apps are Phone, Messages, Music, Maps, and the Now Playing app that is effectively a shortcut to display whatever audio is playing in your car. The core Apple apps cannot be deleted, but they can be rearranged. If you don’t like the default order of the icons on the CarPlay display, go to the Settings app on your iPhone and locate CarPlay Settings under General.3 Selecting your car displays the layout of the icons as they appear when you are using CarPlay. Long pressing an icon lifts it up so you can drag it to another position. Rearranging and hiding CarPlay app icons is accomplished on your iPhone. You don't have to do anything for third-party apps to show up in CarPlay. If you add an app to your iPhone that includes CarPlay support, it automatically shows up in CarPlay the next time you connect your iPhone to your car. 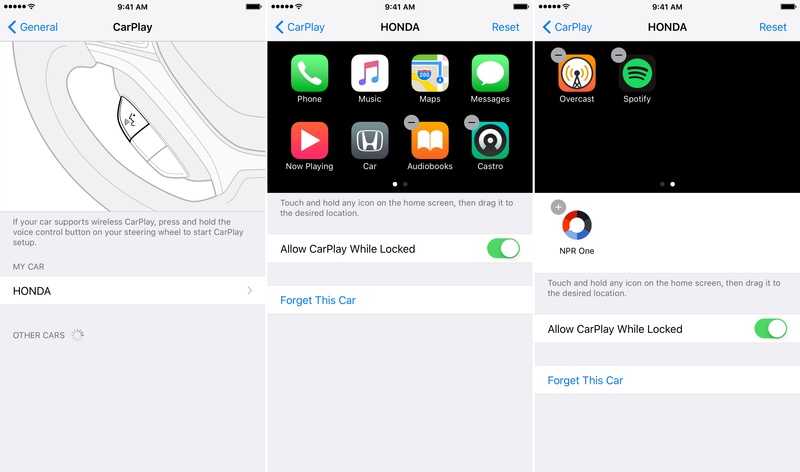 Third-party apps can be hidden from the CarPlay Settings on your iPhone. Each app that can be hidden has a little minus symbol in the corner of the app's icon. Tapping the minus sign hides the app from CarPlay and lists it below the CarPlay screen on your iPhone. The change can be reversed by dragging an app back onto the CarPlay screen. Apple has two apps, Podcasts and Audiobooks, that act like third-party apps in that, unlike the core Apple apps, they can be hidden. Sorry I called you at 10 PM, Myke. I find that the easiest way to call someone using CarPlay is with Siri by saying something like 'Call Myke Hurley,' but you can also scroll through your list of contacts or tap in the phone number with an on-screen keypad. iOS 10 opened Siri up to other telephony apps, which means you can also initiate calls through CarPlay using apps like Skype, WhatsApp, and Facebook Messenger. If Siri finds multiple ways to call a person, it asks you to pick one before initiating the call. 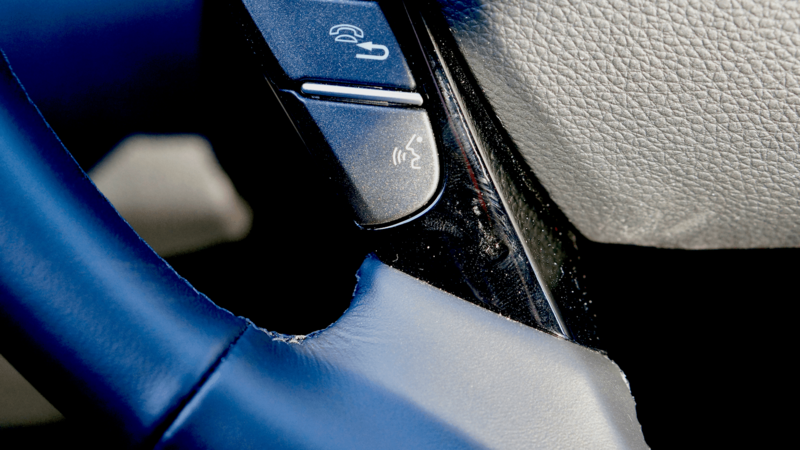 Of course you can also accept calls via the in-car touchscreen or the phone button on your steering wheel if your car has one, and listen to voicemail messages. A surprising number of the features of Apple's iOS Music app are available via CarPlay. The Music app received a big update with iOS 10 that mirrored the new options available on the iPhone such as the 'For You' and 'Browse' sections by adding tabs for each across the top of the screen. Scrolling through long lists of songs, artists, and playlists is one of the things my car is not good at, but even if it were, that isn't a great idea to do while driving. Instead, I access music using Siri or just start a long playlist before I leave home. iOS 10 also added new controls at the bottom of Music's now playing screen. The three dots access a popover that lets you love, dislike, or create an iTunes radio station from a song. 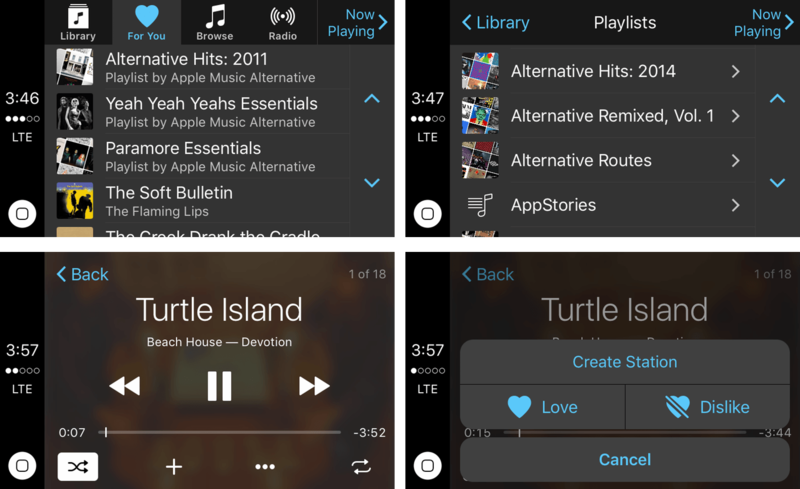 There are also controls for shuffling songs and repeating one song or a set of songs, and a 'plus' button for adding a song to your Music library. Now Playing is an app that doesn't have an analog on the iPhone unless you count Control Center. It resides on the Home screen of CarPlay to act as a shortcut to display whatever audio is playing, which is handy if you leave an audio app to check Maps or send a text message. Maps includes information about nearby businesses. As on the iPhone, you can view your current location or get turn-by-turn directions using Maps via CarPlay. Maps got a design refresh in iOS 10 that carries over to CarPlay making it easier to read and find nearby locations like places to eat or get gas. iOS 10 sends you a notification on your iPhone that tells you where your car is parked if you are connected to your car's Bluetooth system, but with CarPlay, the feature works even if you've turned Bluetooth off. When a message comes in, tap it to have Siri read it and then dictate a response. Messages lets you send and receive texts via Siri. Text messages are never displayed on your car's touchscreen. Instead, Siri offers to read them to you and asks whether you want to dictate a reply. It's a handy feature and one I immediately wanted to see rolled out to other messaging services like Slack. iOS 10 promises to make my wishes come true because SiriKit allows third-party developers to access Siri for messaging. Slack hasn’t added CarPlay support yet, but I can send messages with WhatsApp or send (but not receive) email using Airmail for iOS. I don't use Apple's Podcasts app, but it lets you listen to podcasts in your car that you subscribe to via the iPhone app. Audiobooks has the look and feel of iBooks, but is limited to iBooks' audiobook content. Audiobooks you purchase or download in iBooks on you phone will show up in the Audiobooks library for listening in your car. The number of third-party apps available is limited. There are not many CarPlay-ready apps from third parties. Apple highlights just sixteen CarPlay apps on its website, including its own Podcasts and Audiobooks apps. There is a whole sub-genre of radio station apps with Nielsen ratings tracking built in, but aside from those cookie-cutter apps, I've only seen a handful of notable apps not listed on the CarPlay site, like an update coming next week to Castro 2 and Pocket Casts. That's in part because developers are limited to building audio and messaging apps for CarPlay, but it's also because you have to apply to Apple before you can build CarPlay support into your iOS app. Developers must contact Apple via a form on its developer website and until Apple agrees that a developer can build a CarPlay version of their iPhone app, they don’t have access to the CarPlay API documentation or a CarPlay simulator. Nor can a CarPlay app be built for testing on car hardware until Apple approves a developer. That may have deterred some developers from pursuing CarPlay integration, but there are nonetheless a handful of CarPlay apps that I use and enjoy. 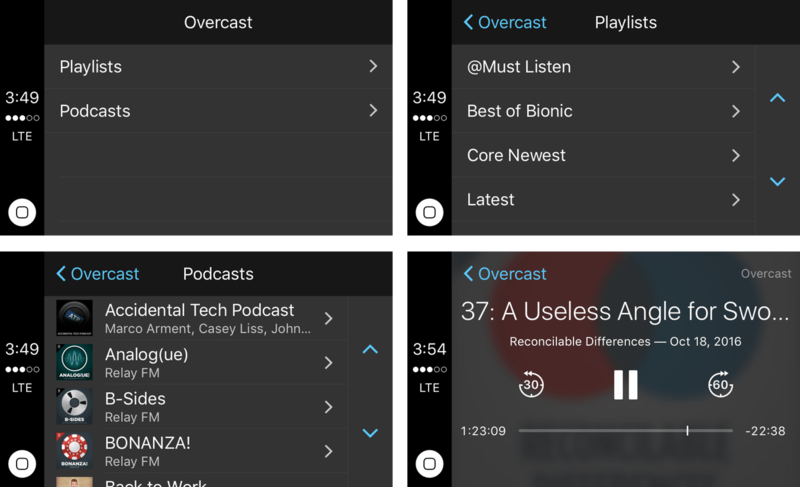 Overcast gives you access to all your playlists and podcast subscriptions. The third-party app I use most with CarPlay is Overcast, Marco Arment's podcast player. In the car, I can access all of my podcast playlists, play and pause episodes, and skip forward and back by the amounts of time I set in the iOS app. There appears to be a bug in Overcast that prevents playback from starting if you switch to Overcast from another audio app. This is not usually an issue for me because I rarely switch between different audio apps when driving, but it's worth keeping in mind if you do. Castro's flat hierarchy works especially well with CarPlay. Castro received a big update in August and will add CarPlay support next week. I use Castro as a supplement to Overcast for my podcast listening, using it to collect one-off podcasts, as opposed to subscriptions. Castro's design translates well in CarPlay because episodes are arranged in a shallow hierarchy consisting of a queue and inbox, which means there is less drilling through lists than other podcast players. 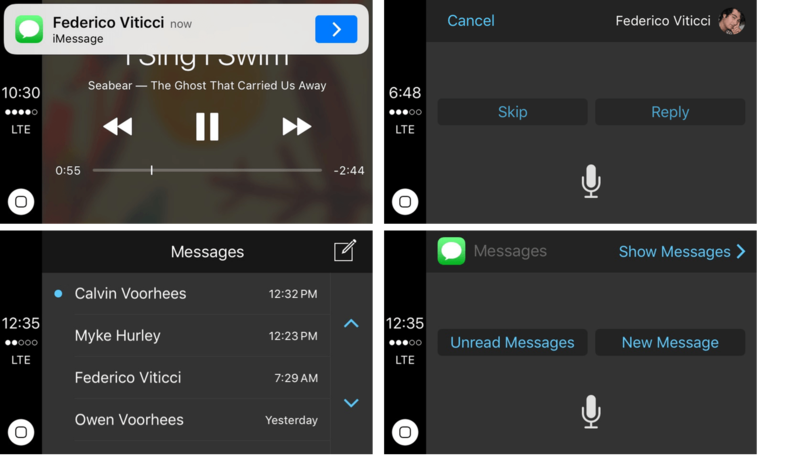 Castro has also adopted the new iOS 10 tabbed interface for CarPlay similar to Apple's Music app to give you easy access to your queue and inbox. NPR One offers the latest news and national shows. I don't listen to the news in the car much, but when I do, NPR One is my go-to app. I can catch whatever is streaming live on NPR's national broadcast or skip right to many popular shows NPR produces. Spotify's UI is a little behind compared to Apple Music, but it provides access to the service's core features. My primary streaming music service is Apple Music, but when I'm in a rut, I like to switch to Spotify's Discover Weekly playlist, which almost always has something I enjoy. The UI hasn't been updated to the new tabbed interface used by Music, but it gets the job done. The number of available CarPlay apps from third parties is small enough that you can list most of the notable ones without too much trouble. In addition to the ones described above, Pandora, iHeartRadio, Pocket Casts, Downcast, Audible, CBS News Radio, and MLB At Bat are all available in CarPlay. Eddy Cue introducing turn-by-turn direction integration with center instrument clusters. Probably the biggest feature coming soon to more cars is wireless CarPlay, which recently debuted in BMWs. If history is any indication, the spread of wireless CarPlay is likely to be slow because it requires Bluetooth and WiFi hardware support. 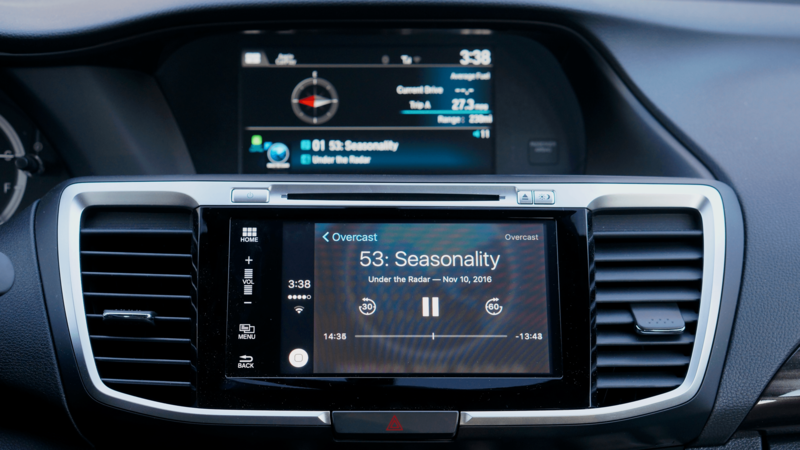 We will also likely see more cars that allow drivers to control systems like heating and air conditioning with Siri, another feature that was recently introduced, but isn't widely supported yet. Finally, Apple announced support for center instrument clusters and heads-up displays with iOS 10. This allows turn-by-turn directions and other data to be displayed on a screen between the gauges on a car or on a heads-up display, instead of on a center touchscreen. I have mixed feelings about CarPlay. On the one hand, it's leaps and bounds ahead of any other car manufacturer's entertainment system that I've tried. But on the other hand, it’s tied to car manufacturer hardware in a way that makes the experience feel clunky at times and un-Apple-like. In addition, it wasn't until I got my iPhone 7 Plus that I was able to enjoy CarPlay fully. With my 6s Plus, CarPlay would randomly disconnect from my car even though it was plugged in. I tried switching Lightning cables, rebooting my phone, turning off Bluetooth, and a bunch of other things, but nothing fixed it. I eventually came across story after story of similar problems in Apple's Support Forums with no solid answers. At the time, I was close enough to getting a new iPhone that I switched to Bluetooth4 and tried again when I got my iPhone 7. Now CarPlay works perfectly. The trouble is, that's exactly the sort of hard-to-troubleshoot problem that crops up where Apple doesn't control the hardware and software. That said, every complaint I have about CarPlay is tied to Honda's hardware, from the slow system boot time to the laggy touchscreen. It makes for a dissonant experience that's hard to accept when CarPlay so closely resembles the iPhone interface itself. CarPlay doesn’t hold up in comparison to using an iPhone. But because it’s not an integrated system, the iPhone is the wrong comparison. CarPlay should be measured against car manufacturers’ built-in entertainment system. From that perspective, CarPlay shines, both from a usability and design standpoint, as well as from a functionality perspective. CarPlay makes me wish for an Apple car that marries hardware with software in a way that creates a superior experience for drivers. Whether or not that ever happens, I'm happy I have CarPlay in the meantime, because warts and all, it puts my music, podcasts, and communication with friends and family at my fingertips, all while charging my iPhone.